Last week I did some spring cleaning and I came across a trunk that had some of my favorite skirts from college. Digging up these relics from my past was not only a fun trip down memory lane but also illuminating. My style has certainly changed in the last decade or so. In college I loved Anthopologie above all stores and gravitated much more to a "Boho chic" aesthetic. This included a lot of long, full, embroidered skirts. Now that I am working, my look has become more polished and refined, yet still fun and playful. I still shop at Anthropologie, but I buy only a couple key items each season whereas I used to earmark almost every page of their catalog, lusting after at least one thing on every page. This Palm Garden skirt is one example of a piece that I recently picked up from Anthropologie. Its print and shape are a little Boho, but I tried to make it look polished with a blouse (instead of just a tee), statement necklace, and cobalt blue heels. I'd love to jet off to some place exotic to take these photos as is always the case in the pages of the Anthro catalogs, but I settled for this little piece of wilderness in the jungle that is Los Angeles. I am glad you kept this stunning skirt who looks beautiful with cobalt and bright yellow. That necklace is awesome! Thanks Ada! I hope you have a great week! Thanks for stopping by Susan! I fell in love with this skirt too and was so happy when it hit the sale rack at Anthro! This is such a cute look. I love the pattern on that skirt with that bright colored top! Thanks Julie! The pattern on this skirt is really fun. I was thinking about pairing it will all black, but maybe next time! i love yellow right now!!!!!! Yellow certainly is perfect for spring! Thanks for stopping by! I love your style, I get a few pieces here and there, great you were able to "dig" this up! 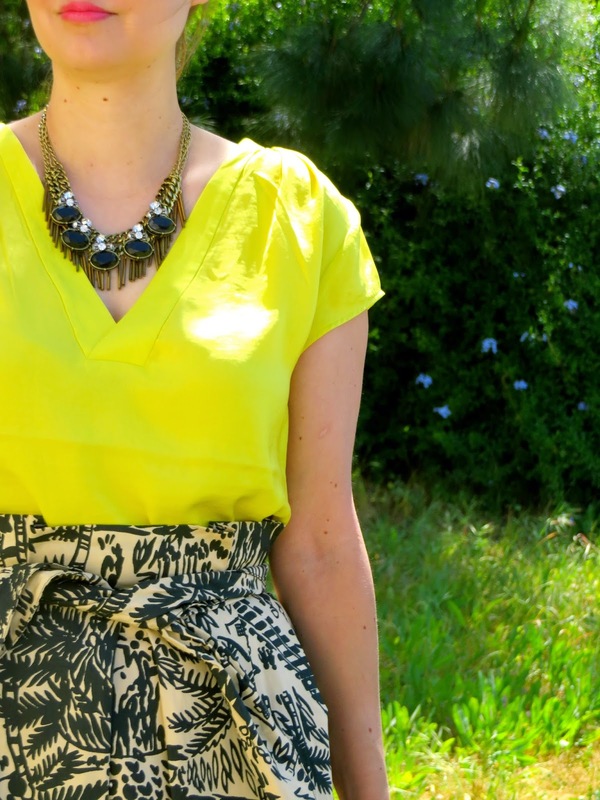 Love the shape and pattern on this skirt with a bright yellow. Hope to see you tomorrow at TH Tuesday link up! Thanks Jessica! The shape is really fun with this skirt because it's a "paper bag" skirt with a tie. I don't have any skirts like this, but it's fun for something different. Can't wait to see you for the link up! Very nice look! Great skirt and shoes! Thank you! These shoes are my new favorites! Love this look, especially the bright colors and fun patterns. Looks like spring has finally sprung! Thanks Sophia! The pattern on this skirt is super fun for spring, and yes, it's great that spring has finally sprung! Thanks for stopping by Jan! I think because of the neutral color palate of this skirt it will go with a lot. It will be fun to style differently in the future. Cute! I love all the pops of color, especially those super cute blue heels. I've been looking everywhere for heels in that color, never thought to look at H&M. I'll definitely need to check them out - thanks for the tip! I love these shoes paired with your outfit! So unexpected!